Landscaping is an practice which that modifies the visible features of land, living elements such as flora and fauna, natural elements such as landforms and bodies of water, abstract elements such as weather and lighting conditions which creates a beautiful environment. Landscaping is mostly done by the professionals because it is little difficult when compared to gardening and different natural elements such as area, terrain, topography, soil qualities, prevailing winds, flora and fauna are considered. Even if the land is not good enough for landscape we can even modify it by changing its shape which is called as grading. The garden can be designed in such a way which gives comfort, entertainment and playtime with seating arrangement, dining spaces, play area and relaxation spots. A bench in a garden makes a good choice for reading or meditation spot, a chaise can also be placed for relaxation . A flower garden looks more beautiful, if not you can go with bushes or hedges. A landscape designs are your choice to make a great impression. You can arrange a pool, play ground if you are active or can even have a croquet area and if you have younger kids it will be useful. If you don’t know how to maintain plants go on with simple ideas of growing bushes, hedges, gravel walkway. The landscaping design in the above image is simple with the stones and has a fire place so that we can feel warm during low temperatures. Here the landscape area looks beautiful with the pea gravel stones. Pea gravel is a small, rounded rock and are fairly inexpensive and are readily available. The area is mixed with sand, clay and has flowering plants throughout the area. There are tall trees around the landscape area which gives a warming and breezy environment. For sitting purpose they have used wood made windsor chairs or else we can use chaises. In the view of the image you can see a beautiful landscape design with a pool which looks fantastic. The area has fencing around it. Perovskia atriplicifolia is the scientific name and in common known as Russian sage which is a flowering perennial plant. It is a perennial plant and subshrub which gives a aromatic smell when crushed. It is best known flower for landscaping areas for its airy appearance. It adds beauty to the land scape. Trees such as American holly Ilex opaca and lodgepole pine can be seen in this image. The landscape area is well designed with the shrubs, bushes and trees and if u want to have a swimming pool in your land scape you can choose this type of design. In the view of this image you can see a irregular flag stone walkway. This flagstone is usually made of feldspar and quartz and is used for paving patios. It has many shrubs such as Buxus sempervirens also known as box wood. It is very popular ornamental plants in the garden particularly valued for its hedges, small leaves, evergreen nature, tolerance and scented foliage. The landscape looks bright with its greenery. In the design we can also see a outdoor area where you can have a seating arrangement for relaxation. There are long trees which gives shade to the home. This image can view you a brick and stone pathway. There are lots of trees, shrubs, plants in the landscape area. It has porcupine grass, cordyline red star, banana tree,silver bush. The water basin in the garden can be a fountain, a small decorative pool, a beautiful waterfall which has a decorative function. The water basin in the garden can turn the atmosphere into nature landscape as it can soften the gravels, stone or ceramic. This landscape looks beautiful with all the flowering and non flowering plants. In the view of this image you can see a manicured garden with grass and trees. The landscape looks greens with the alexander palm tress and these are large palm trees which can be used in smaller places, because of its sleek, elegant form. The chlorophytum cosum also called as spider plant are sometimes called as Airplane plant. These produce arched green and pale yellow stems which produces flowering, eventually developing into spiderettes. The landscape has a bench to get relaxed and has a stone pathway which looks cozy and brings a wonderful environment. The landscape looks beautiful and colorful. This landscape can be chosen if you have a large space and can be decorated with the flowers of your opinion. Here are many flowering and non flowering plants which is aromatic and alluring. This landscape gives a great impression and has a perennial pathway. It has trees such as afghan pine, american holly, Hackberry, Horn Berry tree which is used as privacy hedge lining the fence. Here you can see lots of plants such as shrubbery, rose and flower assortments. The landscape has a stone pathway of light purple color which gives a cozy look. This image os landscape layout looks classy with ornamental plants and has a fencing pf boxwood plants like a topiary.The landscape has grass throughout the garden and has bushes such as silver bush. It has an elevation in the landscape and the walkway is made with ceramic tiles of different shades. Here the plants called as black hero tulips are eye catching in the whole landscape. The black tulip is a spectacular version of tulip and is also called as Queen of Night. It looks tall, glossy and is a black beauty. These tulips are popular today and the fabulous hues of the tulip are amazing. In the view of this image you can see a beautiful landscape and after seeing this design you will definitely have an idea of landscape and get interested in the gardening. Here you can see different plants and trees. The trees such as Emerald green arborvitae, holiday tree or desert pine which is a evergreen tree. Here there is a burning bush known for their brilliant red fall foliage. Initially it looks green and during summer it turns into burgundy red. It has plenty of hedges and bushes with red soil. The landscape has sofas to enjoy the colorful and pleasant atmosphere with a centre table. 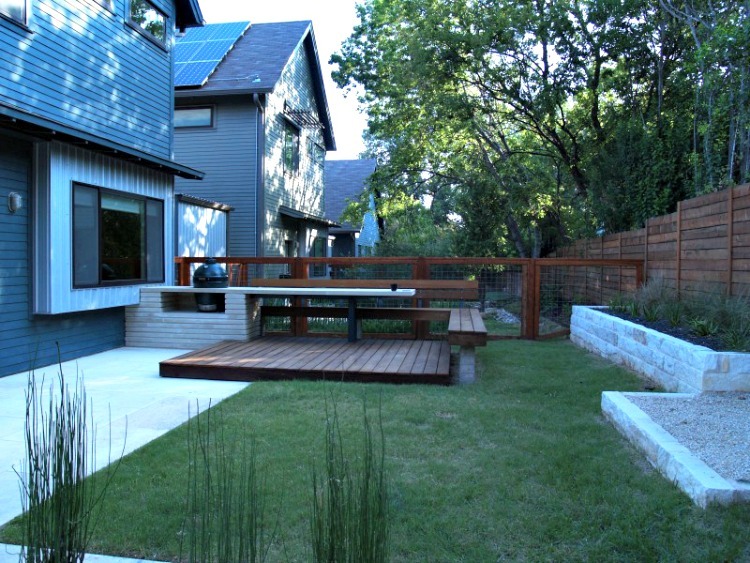 This is an image of small backyard which is a modern residential landscape. Here the landscape is simple and is elegant. You can see grass and gravel path which is a pea gravel and has wooden fencing around the yard. The landscape is inexpensive and is always available. It has horse tail reeds which is a perennial plant and is also called as mare’s tails, snake grass or horse pipes. This horse tail is a useful and attractive plant widely used in landscaping for its unusual and particular shape. If you like you can even arrange edible plants, flowering plants and chaises so that you can get relaxed in your usual times. This view of image has few trees such as Ilex Opaca, white oak and desert pine tree. Here you can see a topiary which is a horticultural practice of training the perennial plants by clipping the foliage, twigs of trees, shrubs, sub shrubs to develop and maintain a clearly defined shapes. 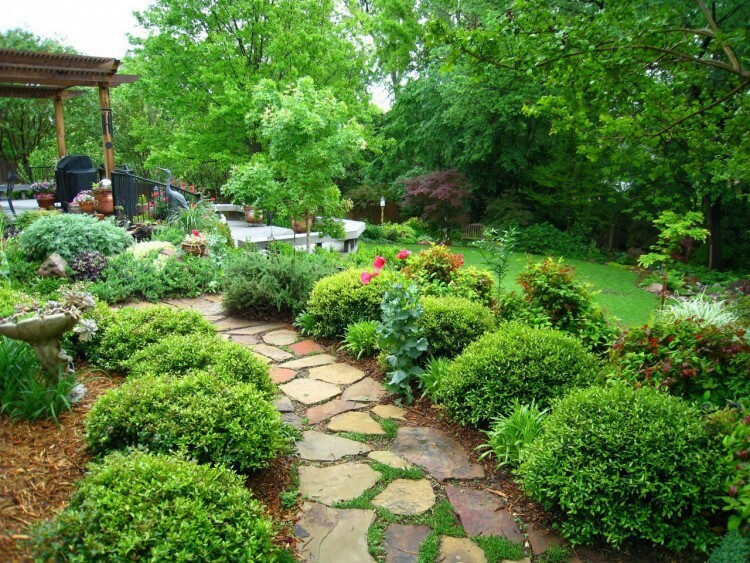 The pathway is made with the bricks and the topiary is practiced for the boxwood plants which looks like a sphere and is well designed in this landscape. If you have a large space you can choose this type of layout which looks loyal and is windy.